Ken Oman and Rodney Brown during Coleraine's defeat of Portadown. Pic by PressEye Ltd. The Pat McGibbon era at Shamrock Park kicked off with a 1-0 defeat to Coleraine as Rodney Brown ruined the Portadown party. The Ports started life after almost three decades of Ronnie McFall in the home dugout with a depleted side and produced a battling performance but Coleraine claimed the points. 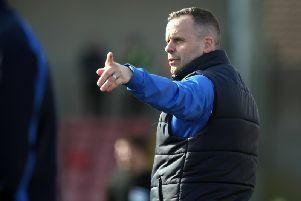 An understrength Portadown side entered the match with teenager Marcio Soares as the lone striker and Chris Casement operating in midfield under the first starting line-up of the McGibbon era. David Miskelly was called into action early on to save a James McLaughlin header off Darren McCauley’s delivery from the left. Brown then attacked a Ruaidhri Higgins corner-kick and Lyndon Kane’s speculative cross bounced off the top of the crossbar as Coleraine pushed to gain control. Brown also cleared the crossbar from distance before Portadown settled and engineered an attacking threat. A Ross Redman free-kick was turned back towards the heart of the penalty area by Ken Oman but Coleraine cleared and only a perfectly-timed Chris Ramsey interception prevented the visitors from a clear sight of goal. Portadown then produced a slick passing move involving Redman, Matthew Parker, Robert Garrett, Soares and Sean Mackle to cut open the Coleraine backline before falling short on the final touch. Miskelly was on hand to punch clear a dangerous cross by Brown then collect McCauley’s curling shot either side of another encouraging attack by the Ports down the left between Redman, Soares and Parker. Higgins’ free-kick drifted just wide of Miskelly’s right-hand post from a promising position on the edge of the area. Portadown ended the first half on a positive note when Garrett clipped a ball in behind the Coleraine defence and Tim Mouncey flashed an angled half-volley towards the target from distance. The second half offered little of note across the early stages, with Mackle testing Chris Johns early on. Mackle had to be alert inside his own penalty area after David Ogilby’s header from the edge of the box bounced off the chest of the unsighted Miskelly and the Portadown midfielder managed to clear the loose ball. However, the game’s defining moment arrived on 80 minutes when a McLaughlin cross from the left flashed across the face of goal and was turned back by Jamie McGonigle for Brown to convert. PORTADOWN: David Miskelly, Chris Ramsey, Ross Redman, Garry Breen, Ken Oman, Chris Casement, Tim Mouncey, Robert Garrett, Marcio Soares, Sean Mackle, Matthew Parker. Subs: Martin Marron, Zac Wilson, Nathaniel Ferris (on for Soares, 70 mins), Mikey Withers (on for Mouncey, 78 mins), Padraig Judge. COLERAINE: Chris Johns, Howard Beverland, Adam Mullan, Ruaidhri Higgins, David Ogilby, Darren McCauley, Ruari Harkin, Rodney Brown, James McLaughlin, Jamie McGonigle, Lyndon Kane. Subs: Michael Doherty, John Watt, Ian Parkhill, Colin Kanwischer.